Every Christmas, I bake a lot so I can give it away as gifts. Things I’ve given away more than once have included hot chocolate mix (this year in a mint iteration), lots and lots of homemade marshmallows (this year, in chocolate and chocolate swirl as well as vanilla), fruitcake (and other fruitcakes), and panettone. This year, one of the things I decided to make was biscotti. 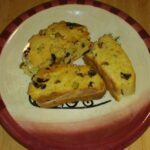 The recipe was for pistachio biscotti, but I decided to add orange zest and dried cranberries to make it more festive. These biscotti were not too hard after I baked them. I had no trouble biting into them without soaking them in coffee or hot chocolate. Flavor-wise, the biscotti were just sweet enough to eat alone, without dunking. The orange zest added a bright hint of citrus that went well with the cranberries. I loved the pistachios in them. I’m really happy with this recipe. It’s the easiest biscotti recipe I’ve made. The dough came together nicely and was easy to shape. It sliced easily, with only a few big crumbs coming off. The biscotti were large enough that they were easy to slice and turn, yet the recipe still yielded plenty for me to divide up as gifts. 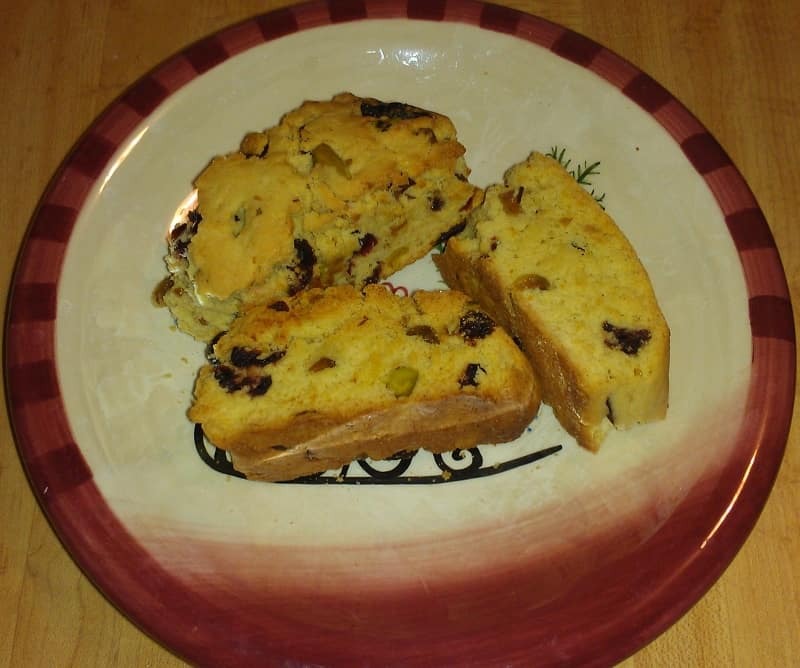 If you’ve never made biscotti before, this is a great recipe to start out with. This is the only biscotti recipe that I’ve ever been happy with (with the exception of an unusual sourdough biscotti), so I’m pretty sure that I’ll make it again. Love cranberries? Try Cranberry-Oat Scones, Fresh Cranberry-Lemon Scones, Cranberry Vanilla Coffee Cake, and Soft Cranberry Orange Cookies. For other biscotti, try Chocolate Buckwheat Biscotti, which happens to be gluten-free. Using a hand or stand mixer, cream butter until light and fluffy. Add sugar, eggs, vanilla, and orange zest; mix until well combined. Add flour, baking powder, and salt, and mix until smooth. Add pistachios and cranberries and mix briefly to combine. Divide the dough in half (I weighed mine, of course), and pat each half into a log about 12 inches long and 1 inch tall. Place on a baking sheet and bake 35 minutes at 350F, until cookie logs are lightly browned. Cool for 5 minutes, then remove to a cutting board. Carefully use a serrated knife to slice each log on the diagonal into 12 1-inch pieces. Place cookies on a cookie sheet cut side down and bake for 5 minutes. Flip the cookies, then bake another 5 minutes. Cool completely, then store in an airtight container.